I can save big on my Moons Over My Hammy without Swiss with these Denny's printable coupons. Since my college days, Denny's has been a favorite. Even my kids love it! So many trips down Memory Lane include Denny's, read more to see why! Are you looking to head to Denny's for a meal out? Not sure the location of the nearest Denny's? No problem! With restaurants established all across the country, chances are you'll find one in your area. Dennys store locator Just click on the link above, enter your zip code or city and state, then click the 'submit' button. A list of all of the stores in your area will pop up and you'll be on your way to enjoying a nice meal at Denny's! Denny's is awesome to offer our military a 10% discount. Just have your ID ready at checkout. Participation may vary from store to store. Denny's offers a senior menu with smaller portions and smaller prices. They offer seniors 55+ a 10% off discount. If you are an AARP member 55+ you will receive a 20% off discount. You can also sign up to receive emails with all the latest Denny's coupons, deals and promotions directly from them. When you do you will receive an email for a 20% off coupon on your next visit! Email can take a couple days sometimes to make it to you. But it will come! Denny's Rewards I suggest using a different email address from your main one though. 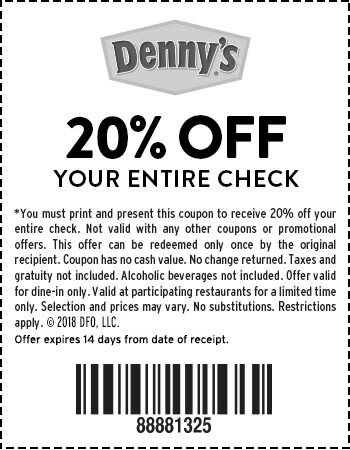 Enjoy the savings with these Denny's printable coupons. Moons Over My Hammy, duh!!! My family's go to place for breakfast is Denny's. We don't get to go very often but it is one of the few place that the kids all agree on when it is mentioned. Also, I have to confess. Denny's holds a very special place in our hearts. Now you are curious aren't you??? Well, when Mrs. Coupon Dad and I got married we were broke. I mean so broke we couldn't even pay attention! We had that whole living on love thing down pat! I wanted very much to give my bride a honeymoon but the best I could afford was a 3 day weekend in Vegas. We had so little money that the only place we could afford to eat while we were there was Denny's. I had Denny's coupons of course so that made it an even better deal. So while on our honeymoon, we ate every meal at the Denny's on The Strip right next to Harrah's. Today, every time we see and eat at a Denny's we always smile about our honeymoon adventures.